For introductory computer courses on Microsoft Office 2010 or courses in computer concepts with a lab component for Microsoft Office 2010 applications. The goal of the Exploring series has been to move students beyond the point and click, helping them understand the why and how behind each skill. 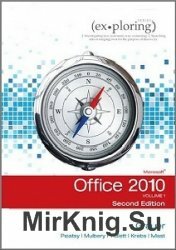 The Exploring series for Office 2010 also enables students to extend the learning beyond the classroom.